MEXICO CITY -- Early in November some 4,600 people flocked to a 12-hour long Day of the Dead Festival at East London's Tobacco Dock. The festival was the brainchild of Crispin Somerville, an Englishman enamored of Mexico who spent a decade in the restaurant and public relations business in Mexico City. The Mexican way of death is unique, issuing from a symbiosis of indigenous beliefs and practices with Catholic rituals. To celebrate the return of the souls of the dead every November, Mexicans set up altars laden with the departed's favorite food and drink and sugar skulls emblazoned with that person's name, while images of Christ, the Virgin Mary and saints flank a photo of the deceased. Marigolds festoon the altars and the graves where relatives gather to share a meal and news of the past year with the visiting spirits. The somber side of the festivities in London this year featured altars to Mexico's murdered journalists and debates hosted by English PEN with the likes of historian Simon Schama, courageous Mexican journalists Sandra Rodriguez Nieto, Alfredo Corchado and Ioan Grillo, actor Diego Luna and myself about threats to freedom of expression and the dangers of reporting from Mexico. 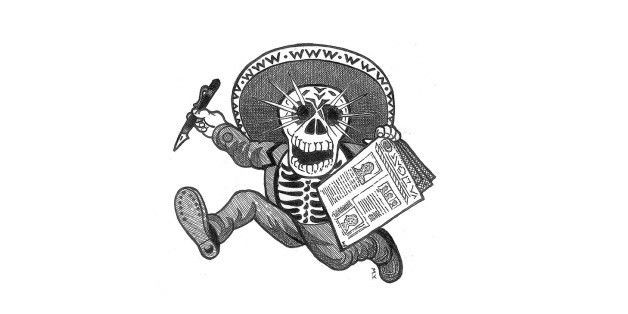 On this year's Day of the Dead, I hoped that Mexico would not continue to be a sacrificial altar for journalists and that every day would not become a day of the dead. When it comes to violence, our country is one of the most dangerous in the world for journalists, photographers, cartoonists and bloggers. When it comes to violence, our country is one of the most dangerous in the world for journalists, photographers, cartoonists and bloggers who write about or witness bloody acts, political corruption, police injustice or are merely in the wrong place at the wrong time. These crimes are rarely investigated, and we seldom hear about the outcome of an inquiry or the arrest of the actual perpetrator of a crime against a man or woman who risked their life, and the safety of their family, to report the news without fear of reprisal, often for a meager fee, out of a professional responsibility to inform society and the world of the violence which is lashing the country. Journalists are not only pursued by organized crime in all its forms, but also by local, state and federal governments, police forces, the military, and even by people whose job it is to impart justice. Not only must the federal government guarantee the safety of journalists, it must also resolve pending cases and punish the criminals, even if they work in government. Otherwise, as time passes most of the cases become enveloped in a tangle of conflicting lines of investigation where the real one is lost or the victim is morphed into the guilty party. A journalist friend recently told me about how when dealing with a notorious political crime, officials often present a new line of inquiry every once in a while which leads the investigation further away from reality, until it reaches a point where nobody knows anything for sure, a kind of legal shell game with the truth. That English PEN should co-sponsor this event is a reflection of the ever-increasing attention paid to Latin America within PEN International over the past two decades. At the 1996 PEN Congress, held in Guadalajara, Mexico, Panamanian novelist Gloria Guardia and Colombian writer Cecilia Balcazar proposed that Spanish join English and French as one of PEN's official languages. At the following year's Congress in Edinburgh I was elected international president. At the 1998 Congress in Helsinki, Spanish was accepted as PEN's third official language and Guardia founded the PEN Ibero-American Foundation, a pioneering regional and linguistic network of centers which would provide translation to ensure access to all PEN documents and proceedings for Spanish-speaking members and to act as a working group on freedom of speech issues. Many of Latin America's 18 PEN centers did not exist before 1998. During my presidency of PEN International (1997-2003), I championed freedom of expression and was a resolute defender of writers whose human rights were violated by withholding of information, censorship, repression, slander and defamation, libel suits and legal action, harassment, death threats, physical intimidation, imprisonment and death. I had personal experience of this. In 1997 and 1998, after speaking at a Committee to Protect Journalists meeting in Mexico City about threats to journalists in Latin America, death threats were repeatedly left on my answering machine that were judged serious enough for Mexico's equivalent of the FBI to give me and my family bodyguards for a year. A Mexican journalist takes part in a demonstration against violence towards journalists in Mexico, on August 7, 2010 in Mexico City. Ronaldo Schemidt/AFP/Getty Images. There have been tremendous advances since my time. Under International President John Ralston Saul (2009-2015), PEN stepped up its activities in response to ongoing harassment of writers in the Americas. We are now hailing suspension of the work ban imposed in 2014 by the government of Honduras on Globo TV journalist Julio Ernesto Alvarado in reprisal for his coverage of alleged corruption by a university official. He was charged with criminal defamation, a common ploy to smother freedom of expression. PEN Honduras (launched in October 2014) and PEN International had brought his case to the Inter-American Commission on Human Rights, which in a landmark ruling on November 5, 2014 ordered Honduras to suspend the ban. A PEN report released in 2014 revealed that "journalists who cover organized crime, government corruption and other sensitive issues are increasingly facing threats and lethal attacks in Honduras, with almost complete impunity for perpetrators." Honduras also happens to have one of the highest murder rates in the world. Former General José Francisco Gallardo, condemned in 1993 to 28 years of prison on trumped up charges after publishing a critical article about Mexico's armed forces and the need for a military ombudsman, was declared a prisoner of conscience by PEN International. After defending Gallardo for nine years and three months after the Inter-American Commission on Human Rights took his case to the Inter-American Court of Human Rights, in 2002 PEN celebrated his release nine days before the Mexican government was to appear before the court. He was the hero of the 2003 Congress held in Mexico City, my last as international president. In his address to the Congress he said that "Without the work of the Writers in Prison Committee, it would have been so difficult for the Mexican government to open up the gates for my release ... I would like to thank God and PEN International. I owe them my freedom." Now Gallardo is running for governor of the state of Colima on behalf of Morena, the National Regeneration Movement, in the upcoming election on January 17, 2016. Winds of charge are sweeping Latin America. Winds of charge are sweeping Latin America, and PEN will continue its vigilant defense of our professionals of the word, with newly elected International President Jennifer Clement, a long-time resident of Mexico City, at the helm, buttressed by Guardia's crucial Ibero-American Foundation. In Central America's Northern Triangle -- El Salvador, Guatemala and Honduras -- racked by drug trafficking, gang violence and official corruption, violence against journalists is of great concern, and impunity rates are high. In the wake of the presidential election, PEN Argentina has protested blocking of the web edition of Página/12, warning of attacks on freedom of expression. Despite the resumption of diplomatic relations between the United States and Cuba, there have been no signs of any change in government policy regarding freedom of speech. There was not a single journalist or blogger among the 3,522 prisoners pardoned on the occasion of Pope Francis's September visit to the island. Dozens of journalists covering the Damas de Blanco (Ladies in White) demonstrations have been briefly arrested in past months. No PEN center has existed in Cuba since 1959; the Cuban Writers in Exile Center was founded in 1997 by Angel Cuadra, exiled in Miami after 15 years' imprisonment in Cuba. Foreign television crews arriving in Caracas to cover the Dec. 6 parliamentary elections in Venezuela were detained and harassed in the airport. The government controls distribution of newsprint, there is an official censorship organ, independent newspapers and TV channels have been virtually expropriated, journalists and twitterists jailed. Is there a future for freedom of expression in Venezuela, now that the ruling party has lost control of the National Assembly? Courageous media and bloggers are forced to practice self-censorship in self-defense against the drug cartels. Mexico is ranked #148 on the Reporters Without Borders world press freedom index. Fifty-five journalists have been murdered in Mexico during the last five years, about one-third of the some 150 who lost their lives in that time throughout the Americas, making Mexico the most dangerous place on the continent for professionals of the word. Courageous media and bloggers are forced to practice self-censorship in self-defense against the drug cartels, while ubiquitous government advertising in print and electronic media is a much more subtle form of coercion. Investigation and prosecution of crimes against journalists is rare, and impunity prevails. Last August, a few weeks after the brutal murder of photojournalist Rubén Espinosa in an apartment in Mexico City, more than 500 writers addressed an open letter to Mexican President Enrique Peña Nieto. The letter stated that "Today, journalists in many parts of the world are under attack, and Mexican reporters in particular are in deadly peril. Organized crime, corrupt government officials, and a justice system incapable of prosecuting criminals all contribute to reporters' extreme vulnerability." There's a lot of work for PEN to do in Latin America. I look forward to a time when we can celebrate the Day of the Dead festival without reference to writers and journalists.